By Sheila Newman, reprinted from Candobetter.net website. A paper by scientists from Museum Victoria and The University of Melbourne has today been published in the Royal Society of London Open Science journal. It describes how the Growling Grass Frog’s genetic diversity is being negatively impacted by rapid habitat loss as Melbourne’s urban fringe continues to expand. Urbanisation is a leading cause of species extinction worldwide and is considered a major threat to global biodiversity. 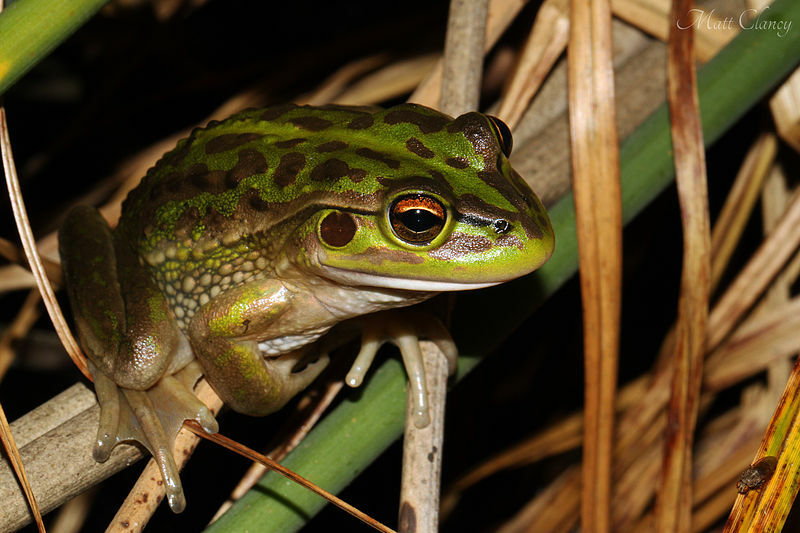 The Growling Grass Frog is listed as vulnerable to extinction in Australia, but isolated populations still persist in the greater Melbourne area. Many of these populations are located in the city’s proposed urban growth area, causing concern as the species is known to be sensitive to habitat fragmentation caused by urbanisation. The study found that there is decreased genetic diversity in the remaining populations found in Wyndham, Melton and Hume-Whittlesea, making the frogs more prone to inbreeding and less able to cope with the threats posed by urbanisation. The scientists have also found that populations in the Cardinia Shire, one of the four regions studied, are genetically distinct. “Genetic diversity is key to maintaining the population of Growling Grass Frogs in Victoria as it makes them more resilient to the threats posed by urbanisation. If they are to survive in greater Melbourne the population found in Cardinia will require separate conservation management,” said Claire Keely, PhD student, Museum Victoria and The University of Melbourne, who led the study. This study demonstrates the importance of genetic research on vulnerable species and can be used to inform conservation efforts to maintain populations. The team are currently looking to gain further funding to extend the study into the Gippsland region in order to find out more about the frog species genetic diversity and how the Cardinia populations are related to those further east. The Growling Grass Frog is one of the largest frog species in Australia. They are found in south eastern Australia and were once so abundant in Victoria that they were used for dissections in universities and to feed the snakes the Melbourne Zoo. For interviews, images, video footage or to meet a Growling Grass Frog at the Melbourne Museum please get in contact. Environment Justice Victoria refused to consider providing help to a family concerned about the effect of a wind farm development on growling grass frog habitat and individuals at a site in the Otways region. That is because it has a policy of supporting wind farms in all circumstances. I so support Dr Geoff Mosley, fine conservationist, former ACF Director ACF. I agree with him regarding Environment Justice Victoria who refused to provide help to a family concerned about the effect of a wind farm development on growling grass frog habitat and individuals at a site in the Otways region, because it has a policy of supporting wind farms in all circumstances. Growling Grass Frogs are living behaving entities that deserve to survive.